For some reason, conspiracy and doomsday theorists chose this small little comet — one that was to come no closer to Earth than 34 million km (21 million miles) during its closest approach on October 16th – to be the harbinger of doom. But here we are, just fine. Well, except for wars, terrorism, global warming and other things that the human race inflicts on itself. There are enough bad things going on here on planet Earth that conspiracy theorists shouldn’t fabricate doomsday predictions just to needlessly scare people for fun and profit. So why didn’t Comet Elenin cause doomsday? 1. It couldn’t have hit Earth, or affected Earth’s orbit. The comet was predicted to come 34 million km (21 million miles) away at its closest approach. Just in case you can’t figure that out, one object can’t hit another at that distance. Plus, the gravity exerted by a small object won’t affect Earth either. To put this in perspective, this distance is only a little closer than the closest approach of Venus to Earth, and roughly 100 times the distance from the Earth to the Moon. Nothing happens to Earth when Venus is at closest approach, and Venus is 12,000 kilometers in diameter, while Elenin was 3-5 kilometers across. When the comet was intact it had less than a billionth of the tidal force of the Moon. Where Comet Elenin should have been in the sky on October 16, 2011 shows nothing left of the the distinegrated comet, and all that is visible are star trails. Credit: Ian Musgrave, using the Global Rent-a-Scope. 2. Comet Elenin fell apart. Sometimes, long period comets that originate from the outer parts of our solar system begin to dissipate as they get closer to the Sun. But Elenin was hit by solar flares from the Sun on August 19 and began disintegrating. When it reached its closest point to the Sun on September 10, it basically was toast. Just recently the location of where the comet should be has become visible in the night sky, out of the Sun’s glare. Several images from different amateur astronomers show absolutely nothing. The comet has completely disintegrated and fallen apart. 3. What is left of the comet won’t cause problems, either. The average density of a comet’s coma is about the same as the density of the atmosphere on the Moon, and any rocks or debris that might be left over from the comet are small enough that they would burn up in Earth’s atmosphere if Earth does go through the wake of the coma or debris from the comet. And remember, several times a year Earth goes through the debris from comets and all that happens is we get beautiful meteor showers to enjoy. And after this, don’t worry about Comet Elenin or its leftovers. Earth won’t pass through it again for another 12,000 years. So move along, folks, nothing here. Comet Elenin is just another doomsday that didn’t happen, just like NASA, Leonid Elenin, and many other people said. And if you proudly claim you aren’t a sheeple and are now just waiting and searching for the next doomsday theory to hang your every hope upon, why don’t you try expending your energy on this: Enjoy every day on this beautiful planet and live your life in its fullest. Use real science and learn to think critically. And perhaps you could be a person who could help come up with solutions to some of the real problems on planet Earth. As far as Comet Elenin goes, the only chance of impending doom is for the comet itself: it is disintegrating and quickly fading away. Australian amateur astronomer Michael Mattiazzo has been monitoring this comet’s trip toward perihelion (closest point in its orbit to the Sun), which occurred on September 10, 2011, and he says Comet Elenin has likely has not survived. The image above was taken by Mattiazzo on today (Sept. 14) and it is barely visible as a disintegrating smudge. Comet Elenin – the comet that has created a hoopla of completely nonsensical, non-scientific doomsday predictions — faded dramatically after being hit by a solar flare on August 20, as we reported earlier. Subsequent images revealed a spreading, diffuse coma. It will likely continue to fade and become more diffuse. Elenin’s mass is smaller than average and its trajectory will take it no closer than 34 million km (21 million miles) of Earth as it circles the Sun. It will make its closest approach to Earth on October 16th, but was closest to the Sun on Sept. 10. 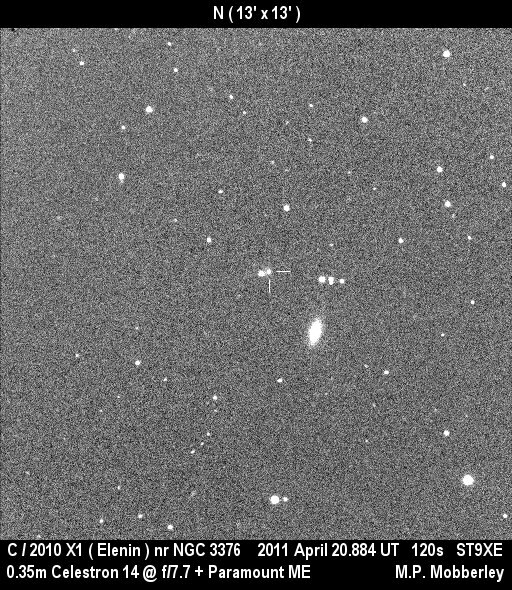 Elenin is at about magnitude 10 now, and fading as it is in the process of disintegrating. It failed to recover, (you can see a series of images taken between August 19 and September 11 on Mattiazzo’s website), with the comet’s the nucleus taking on an elongated appearance with progressive fading. “Such acts of disruption are all too common for small comets that have close encounters with the Sun,” Mattiazzo said. One of the most spectacular examples of a comet breaking apart occurred in July 2000 when comet C/1999 S4 LINEAR disintegrated and several observatories had a good view of the action. Elenin is now nearly in an inferior solar conjunction, where it will be directly between the Earth and the Sun (so we won’t be able to see it due to the brightness of the Sun). Another amateur astronomer from Australia, Ian Musgrave, says it is doubtful that it will be bright enough to see in the cameras from the Sun-orbiting SOHO spacecraft, and that we will probably have to wait until October when the comet moves away from the Sun for powerful Earth-based telescopes to try and find if any of the comet survives.